Here's what you'll want to know! It's a makerspace designed especially for youth ages 8+. The 1,250 sq. foot studio workshop offers a place where youth makers and families can design, invent, create and collaborate using real tools – the same materials and processes used by artists, builders, programmers and entrepreneurs. From sewing and woodworking to digital design or 3D modeling, you'll find everything you need to turn idea into reality. Where is Maker City located? It's located inside Explore More Discovery Museum on the 2nd floor, adjacent to the 2nd floor admission desk. When is Maker City open? Maker City requires a great deal of supervision and we try to offer hours that allow us to serve the greatest number of participants. This varies seasonally and you'll find extended hours during school holidays and summer breaks. Please refer to our calendar for Open Make times, Boot Camps and special activities. How much does it cost to visit Maker City? Maker City entrance is included in the regular museum admission fees ( $7 per person for adults and children). Members visit free all year long. What is Open Make? This is a time when youth can drop in and explore many aspects of Maker City. It is self-guided and our supervisors will assist students in their areas of interest. When the space is particularly crowded, some of our making areas may not be available. It is our job to foster creative exploration while also maintaining the highest level of safety and visitor experience. Anyone who is 8+ can come to Open Make and it is not mandatory to have completed a Boot Camp session. What are Boot Camps? We offer an ongoing series of introductory sessions to teach the basics of some of our more complex work stations. You can sign up for 2D design necessary to use the laser cutter or 3D modeling that is used for the 3D printer. Woodworking and sewing are also offered. The boot camps are free for members or with paid museum admission. Class sizes are limited so advance registration is required. Why do children have to be at least 8 years old to participate? We understand that all children have different abilities and interests and that age is never a perfect indication of readiness. In this instance, we listened to the kids. During numerous focus groups with older youth, we heard time and time again that while they love the museum activities, they really wanted a place of their own. A place where they could have some independence and explore creatively. This is why Maker City exists and as hard as it is to tell the 7 1/2 year old that they will have to wait, it's very special to our older kids. Thanks for understanding and supporting! How do we get started? Check the calendar and plan your Open Make visit or sign up for a workshop. You'll need to check in at the 2nd floor desk before entering the space. Every participant must have a waiver on file. If you don't have one, you can print a copy HERE or we'll have them available at the desk. Do adults have to stay with their children in Maker City? We understand that adults often have children of multiple ages with them so we are happy for you to leave your child in our care in Maker City once they have signed in. We generally ask adults to check in within 90 minutes to see if your child is ready to leave. If it is a particularly busy day, we may limit time to 60 minutes so others can have an opportunity. We will not release a child into the museum without their caregiver. When bringing your child to Maker City, please walk them in to make sure there is space available. Explore More is a 501(c)(3) nonprofit organization. 40% of the annual operating budget comes from fundraising events, sponsorships and donations while the other 60% is from admission fees, memberships, program fees, etc. Maker City costs are significant. We are pleased to have generous donor support. Please take time to see our sponsor listing on the Maker City page and at the entrance. Aaron Kishbaugh helps students during a summer boot camp. Do you need volunteers? YES, we'd love to have more volunteers. Please complete a volunteer form and we'll contact you with details. Who works in Maker City? While you'll see many of our staff members and volunteers helping throughout the year, the people you'll most often see are pictured below. Aaron Kishbaugh, of JMU X-Labs, was instrumental in helping us launch Maker City and continues to provide guidance and expertise as we enter our second summer of making. Have more questions? Contact us at info@iexploremore! Jacob is a recent graduate of Appalachian State University with a degree in Product Design and a Japanese Language and Culture minor. Jacob started as an intern in the Spring of 2018 and later became a staff member and lead supervisor in Maker City. His favorite part about working in Maker City is witnessing the "ah-ha" moment that kids and parents experience when they find a solution to a problem or create something awesome. He hopes that Maker City participants will develop a healthy respect for failure instead of a fear of it. His hometown when not in the 'Burg...Kernersville, North Carolina! Fun facts...Jacob is a certified martial arts instructor and can play the mandolin! Brianna is currently serving as an intern in Maker City. She attends JMU and will graduate in May 2019 with a double major in Industrial Design and Art Education. She considers herself a maker because she loves designing and creating things with her hands. When asked what she wants the Maker City kids to take away from the experience, Brianna says, "I want kids to learn just how exciting it can be to use their creativity. 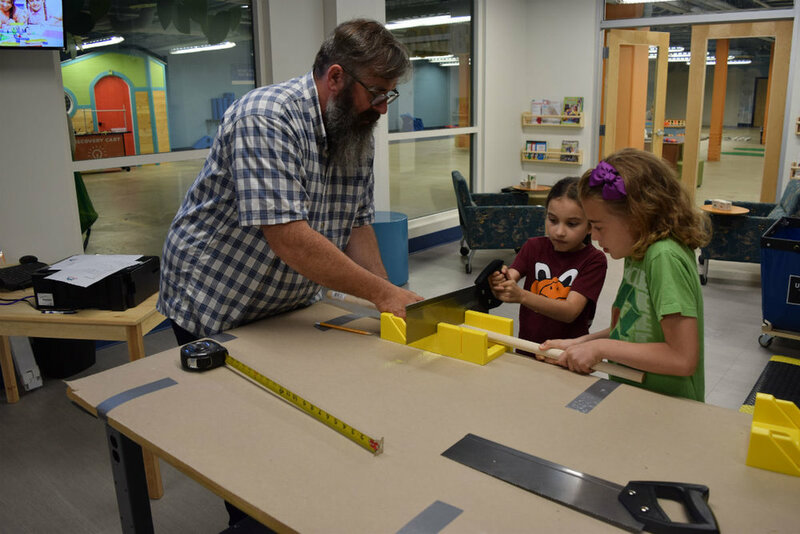 Maker City is a place where kids can experiment and explore with so many different materials, and seeing children come back again and again to continue working on a project or try something new makes me realize they are starting to catch on to the world of making." Her hometown when not in the 'Burg...Virginia Beach! Olivia is currently serving as an intern in Maker City. She attends JMU and will graduate in May 2020 with a major in Industrial Design. Olivia is a maker because it allows her to play with different materials, learn new skills, and share her creations with friends. She loves that Maker City provides so many resources for everyone - kids, teens, and even adults. She hopes that everyone in Maker City will learn that it's okay to make mistakes, start over, and problem solve when they're making and creating. Her hometown when not in the 'Burg...Richmond, VA! Fun facts...Olivia fosters dogs and has been part of the NBA halftime show twice!